We woke up to beautiful sunny skies. The weather forecast was sunny and warm all day. A perfect day for viewing Mt. McKinley. We started the day by walking to beautiful downtown Talkeetna. Stubbs, the Mayor of Talkeetna. He hangs around downtown. I had a spinach bread for lunch. It’s kind of like a square pizza with spinach and cheese. Next we stopped by Talkeetna Air Taxi at the airport to book a flight-seeing tour with a glacier landing. The first flight available was at 4:00 so we returned to the RV park to get the truck and drve to the Talkeetna overlook for a view of Mt. McKinley with no clouds. At 3:30 a van picked us up to take us to the airport for our flight. There were six passengers on our plane – two guys and a gal from Norway, a man from Maryland, and us. Our pilot Alex was from Georgia. The flight was one of the most amazing things I have ever done. Seeing the mountains from the air and flying so close to the south face of Mt. McKinley was awe inspiring. It’s a day I will never forget. Really, really close to the mountain! Ours was the only plane on the glacier and we had plenty of time to enjoy the jaw dropping beauty around us. We landed on the Ruth Glacier. Hard to believe it was warm enough to wear short sleeves. We flew low over the glacier as we started our return trip to the airport. What a glorious day it was! A day we will never forget. Perfect. Day 57: Thursday, July 11, 2013 Teklanika Campground to Talkeetna, Alaska. Talkeetna Camper Park Site 34. 182 miles traveled. The sky was still overcast as we drove the 30 miles from Teklanika to the Denali National Park exit. Our chances for a clear view of Mt. McKinley on our drive south on the Parks Highway were looking pretty slim. Mt. 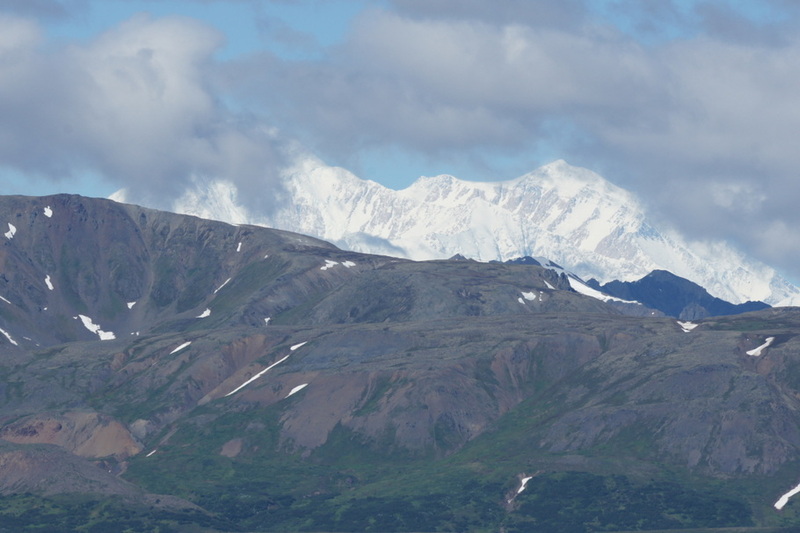 McKinley, at 20,320 feet tall, is the tallest mountain in North America. On a clear day there are overlooks along the highway between Denali National Park and Talkeetna where the mountain can be seen. We were keeping our fingers crossed the sky would clear. The views were spectacular as we drove along. Then finally, parts of Mt. Mckinley came into view at one of the overlooks. Stops at a couple of other overlooks were disappointing with clouds completely covering the mountain. Finally, as we drove into Talkeetna, we were rewarded with spectacular views from the Talkeetna overlook. Happy happy happy! We checked into our campground and watched the Alaska Railroad trains load and unload passengers right behind our campsite. We enjoyed a great dinner on the outside patio at the West Rib Cafe and Pub which was featured on an episode of The Travel Channel’s Man vs Food. An Alaskan Crabcake sandwich for me and Halibut and Chips for Henry hit the spot.